salads – What's Cookin' @ Special Collections?! May is National Salad Month. I know, not everyone loves their veggies, but historically speaking, “salad” can mean a lot of things. From dressed lettuce to frozen cheese and fruit, there are a ton (probably literal and figurative) of recipes in between, some more traditional than others. I’m currently working my way through a generous donation of 27 boxes of culinary materials–the first cart load of items is parked outside my office to prepare for cataloging and there are a range of titles relating to salads. This #foodfriday, here are a few ideas for the classic and the experimental salad fan. 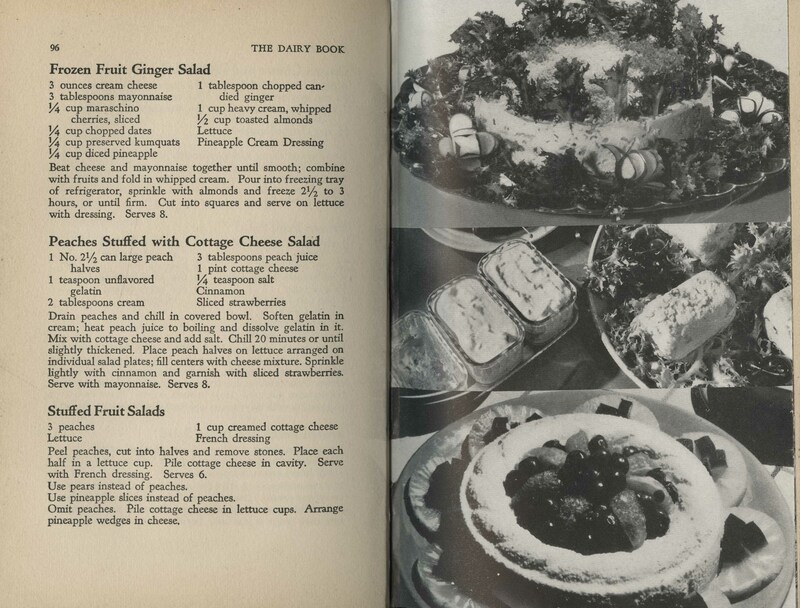 Next up, some more substantial meat-filled salads from The Salads Cookbook (1979), also from Southern Living. Since the front cover didn’t have a title (but does have a lovely caesar! 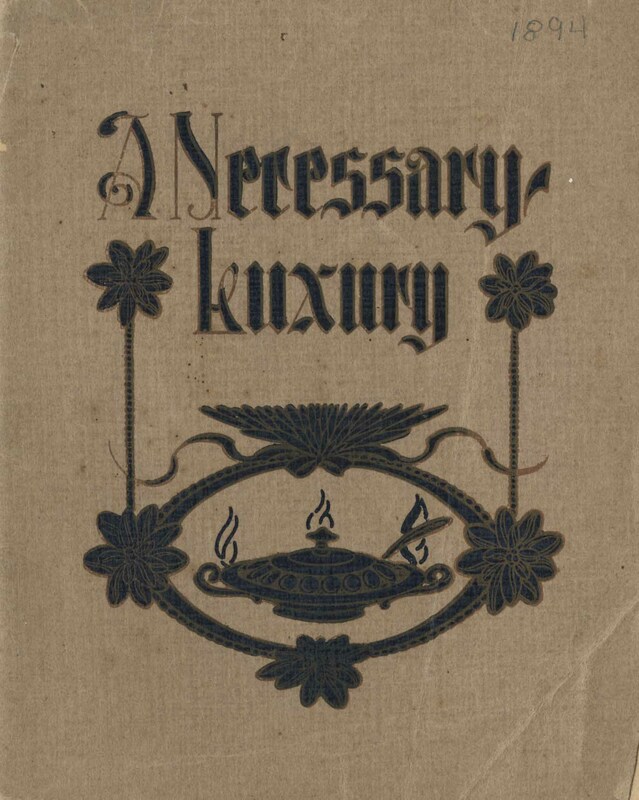 ), I included the title page below. Also, some rather interesting chicken options. Chicken and bananas? Pineapple & chicken in tomatoes? Well, at least I could totally get on board with all the avocado options! 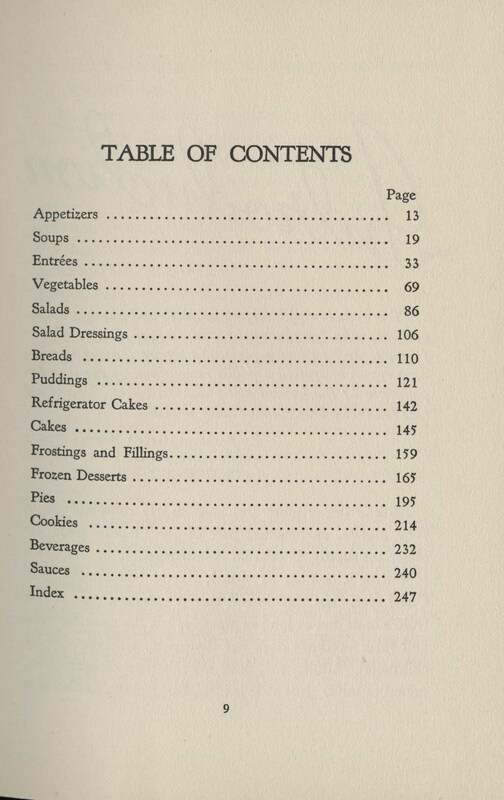 Although perhaps I should have put this one first (because of the back cover image), the idea of picnic salads fit in better here, after the substantial/heartier options. So, this is the Better Homes and Gardens All-Time Favorite Salad Recipes (1978). The front cover features a “bowl” salad, a salad with its own edible bowl, and something more, well, freestanding. (Yes, there’s gelatin ahead.) The second page include some great picnic options, as well as advice on transporting salads for your outings. The back cover is also a handy guide to lettuces! None of these books are cataloged yet, but once they are, you can visit us in Special Collections to give them a look. (Actually, if you’re really interested and you come by fast enough, you might still catch them before we send them off for cataloging!) In the meantime, we have PLENTY of other salad books in the collection. Books with leaves (pun intended, of course) full of recipes, just waiting to be discovered. The lesson for today is that salads come in many forms, some more traditional, others more…inventive. It’s also a great reminder of how the idea of a salad has changed and, in this particular case, gives us a sense of the trends in the late 1960s 1970s. And maybe it even offers us a little encouragement. Even if chicken and bananas don’t seem like an obvious pairing, someone liked it enough to publish it. So next time you’re wondering if you should put two ingredients together in your salad bowl, take a chance. We’ve got your back. While “Delightful Recipes” isn’t dated, it’s probably from around the same time period as our second pamphlet, “Sparkling Party Recipes,” which comes from 1955. There are plenty of party hints and party themes for the hostess looking to impress, too. Bringing bottled drinks on a picnic? Put a dish full of ice at the bottom of the basket to keep them cold. Want to coordinate your food and drink? Try dressing up your sandwiches and drink bottles (though that image of grinning food and beverages is a little creepy)! Want to confuse your taste buds? Freeze cubes of one flavor and pour another flavor over them! Carbon dioxide has a peculiar dietetic value. Medical authorities point out that, when taken internally, it acts as a digestive stimulant, increases appetite and promotes absorption of food…The energy in bottled carbonated beverages comes from the pure sugars used. This pamphlet also offers a list of “noted authorities who have put on record their statements as to the health value of carbonated beverages.” The statements were available by writing to the sponsor, the American Bottlers of Carbonated Beverages. And, no doubt, solicited by them for just this purpose. In any case, this touting of the health benefits seems a bit different from arguments today about the high amounts of sugar and sugar alternatives in modern sodas. Both of these pamphlets are part of the Culinary Pamphlet Collection (Ms2011-002), which we’ve highlighted before. However, it’s an ever-expanding collection and there are always new items to share. With about a month before the students come back, our “Summer Cooking School” lessons will continue for a little longer. Then I’ll have to find some new historic items to share. Until then, remember carbonated beverages aren’t just for the glass. They can be the highlight of any party…or hot weekend (like the one we’re headed for here in Blacksburg). Happy New Year! It’s hard to believe we’re already a week into 2016! It’s the time of year when everyone starts putting their resolutions into practice. Me, I’m not much of a “resolution-at-New-Year’s” kind of woman. I just have an on-going resolution to keep at least some part of the surface of my desk visible under the notes, paperwork, and new acquisitions at all times. In early January, before our student employees come back and before classes start up again, my goal is usually to create MORE of the that visible space for a couple of weeks so everyone else can cover it up by February. This week had been relatively successful until yesterday when a bunch of new items arrived (with paperwork), I talked to two potential donors (scribbling notes as I went), and I found a spreadsheet inventory of some architectural drawings from a collection I’m trying to do some processing work on (that I had to print out and start marking up). In other words, I’m back to my usual organized chaos (yes, I firmly believe it CAN exist). And I’m okay with that. Mayonnaise Dressing…that’s mayo from scratch, of course! So much fruit, gelatin, and dairy products…so little time? Seriously, there are LOTS of fruit salads in this book! With it only being Week One of 2016, we’ve got at least 51 more blog posts in this year’s future! Hmm, maybe I shouldn’t have typed that–it’s an intimidating number now that I see it. On the other hand, with 297 posts behind us, 51 is only 17% of that-so, it should be easy, right? Anyway, I have a series of posts planned for Women’s History Month this March and I may try to come up with a few more themed series as we go. I also have a running list of topics or items for posts. However, this is also a great opportunity for YOU to tell US what you’d like to learn more about or how we can help inspire you. “What’s Cookin’ @Special Collections? !” has been running for more than 4 years and we have a small (but growing) group of followers, between WordPress, Twitter, email, and RSS feeds. So, do you know about a particular item or collection we have but want to know more? Are you curious about a food-related topic and wondering if we have any relevant books or manuscripts? Love a particular recipe, cookbook author, educator, culinary figure, food trend, or even agricultural process? Do you have a favorite food or drink you’d just like to see us share something about? Let us know (today or whenever the mood strikes you)! You can comment on this post, tweet at @VT_SCUA, or use any of the options on the Contacting Special Collection page of the blog–We’ll be here! This week, I had it in mind to find something Halloween related. Then I realized, with a busy day today and tomorrow, hunting for Halloween recipes wasn’t on my menu. We haven’t talked about dairy in quite some time, though, and that seemed as good a topic as any. The even better news is that I happened on a “Halloween Pie” recipe in the book I selected. Sometimes, the best thing you can do is not look for what you want with the History of Food and Drink Collection. Sometimes what you’re looking for finds you. The Dairy Cook Book, 1941. Front cover. The Dairy Cook Book, 1941. Table of contents. The Dairy Cook Book, 1941. Pictures include Cauliflower with Cheese Sauce (above) (which also looks a bit Halloween-eqsue, if you’re looking for a brain-like item on your menu!) and Potatoes in Savory Sauce (below). The Dairy Cook Book, 1941. 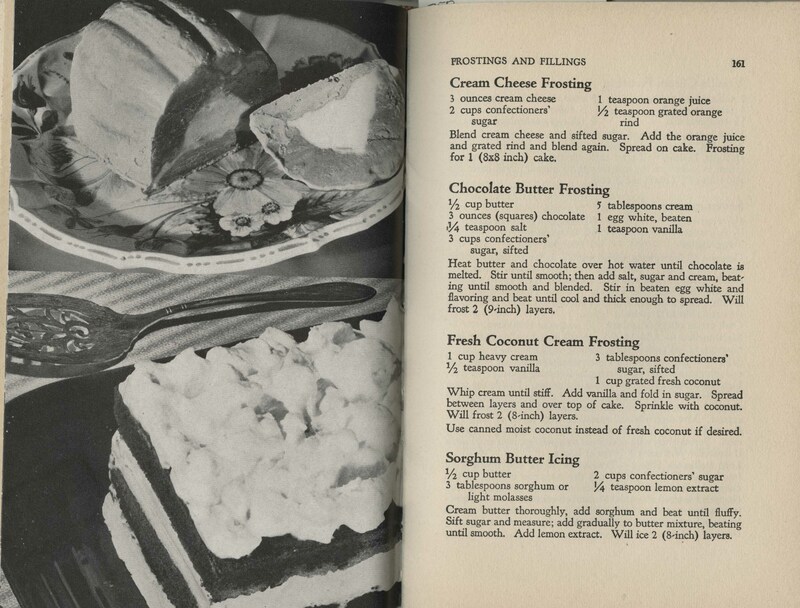 Pictures include Chicory Crown Salad (top), Frozen Cheese Salad (middle), and Cottage Cheese Ring (bottom). There are a LOT of frozen salads in this section of the book! The Dairy Cook Book, 1941. Pictures include Bombes (above) and Sour Cream Chocolate Cake (below). 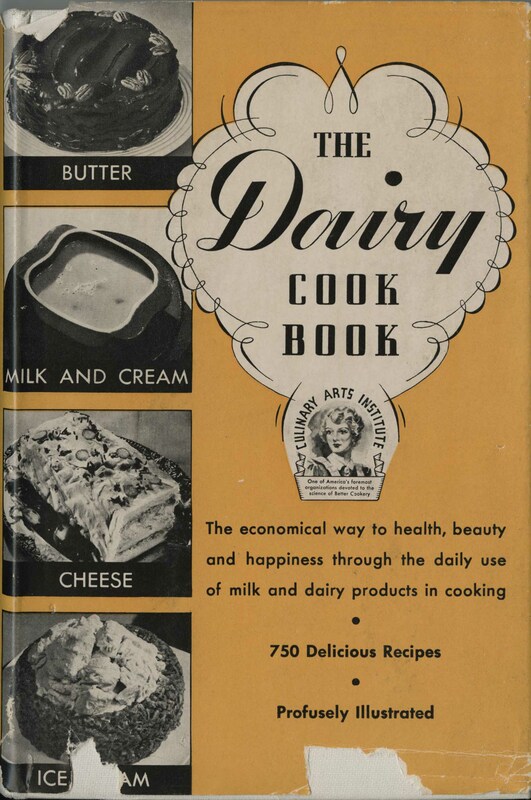 The Dairy Cook Book, 1941. Pictures include Chocolate Malted Milk (above) and Banana Milk Shake (below). 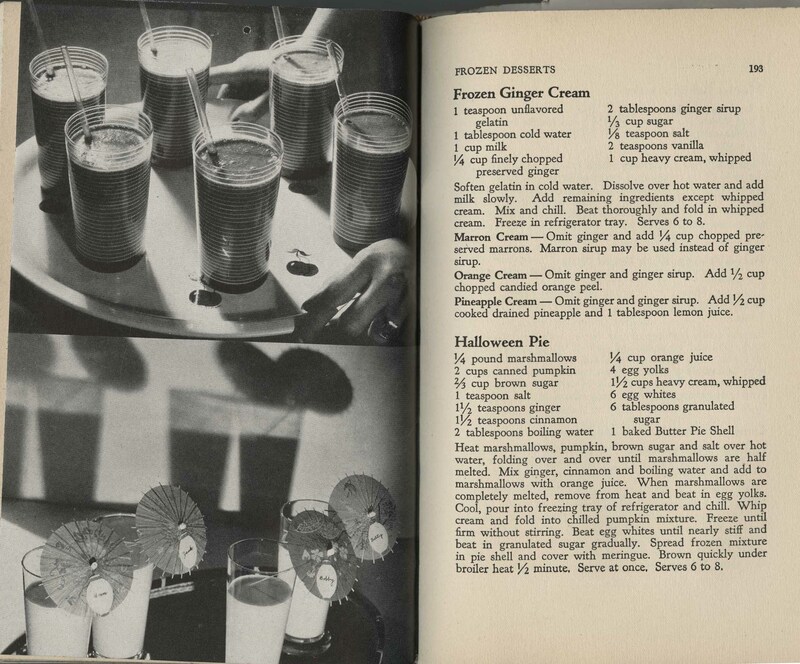 Also, note the recipe for Halloween Pie, which sadly, isn’t pictured anywhere. As is often the case when things are busy (like at the end of the semester), and your loyal archivist/blogger Kira is, well, less likely to plan her blog posts in advance, the best option is wandering the shelves. With more than 4,400 books and nearly 100 manuscript collections, there’s a lot I don’t know about and always something new to discover. 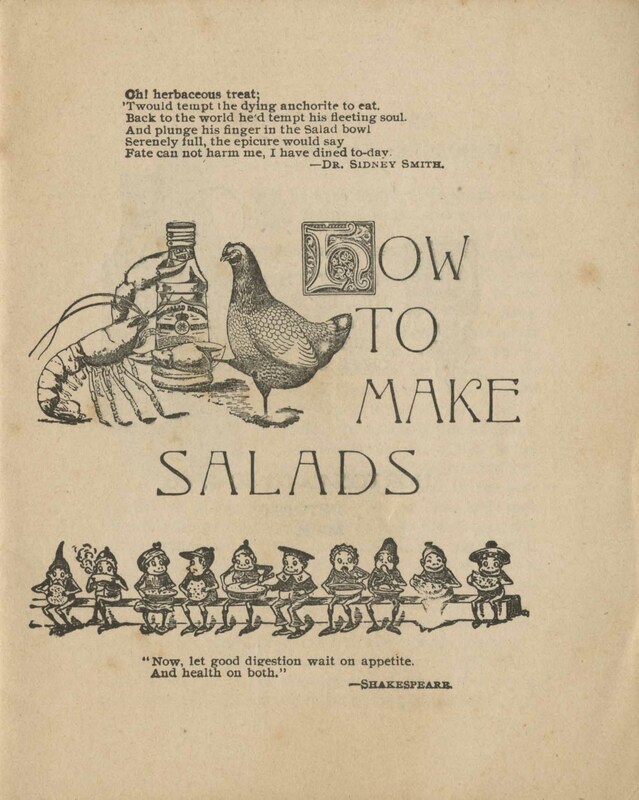 I’m getting into the habit of training myself not to look only at eye level, which led me to today’s feature item: How to Make Salads from 1894. Quotes by Sidney Smith and Shakespeare, a collection of elves, and what can only be described as a chicken, a lobster, and a bottle of salad dressing dancing in a circle? How…interesting. All kidding aside, this is a rather neat little pamphlet. It’s easy to joke, but these 16 pages are full of practical recipes. 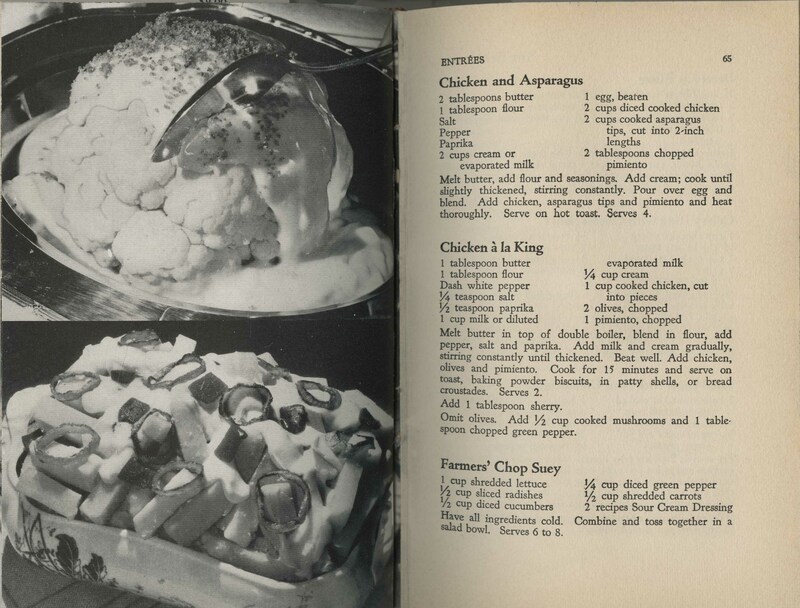 There isn’t much variation of the secondary ingredients (celery, salt, pepper, vinegar, and the occasional other vegetable or garnish) and of course all the recipes include Royal Salad Dressing (the booklet’s sponsor). And there is a surprising range of primary ingredients from classics like chicken, lobster, cabbage, egg, or potato to the more exotic/unexpected ones like oyster, frog legs, sweet potato, or cauliflower. So, no matter what your salad needs, there’s something here for you. According to WorldCat, Virginia Tech is one of only four academic or public libraries with copies of this, and it doesn’t appear to be digitized, which suggests it is relatively rare. I’m hoping to get the entire item scanned and online in the not-too-distant future. 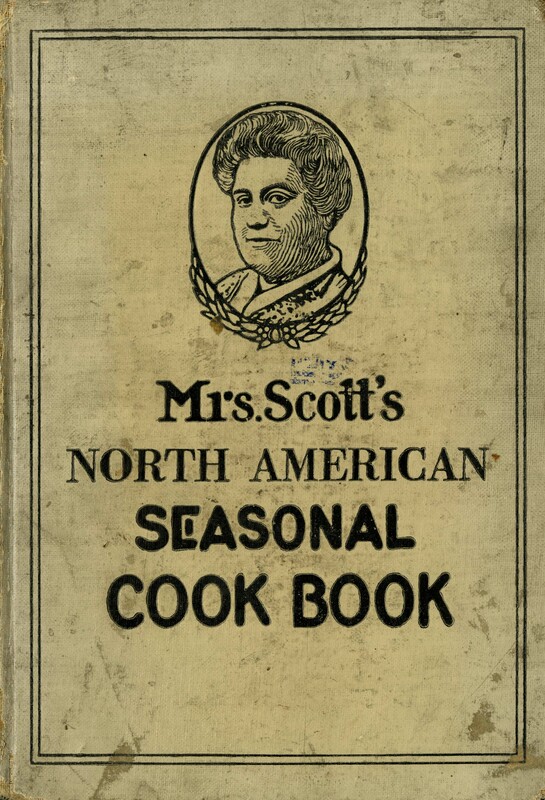 This is the first cook book ever planned to help the housewife take advantage of Nature’s changing supply of foodstuffs from season to season, tho such timeliness is the chief determining factor in the economy, palatability and healthfulness of many articles of diet…The average woman who never thought of the matter in this light will be astonished at the usefulness of this Seasonal Cook Book. It will enable her to make timely use of what is in market, and by so doing will help not only to reduce the cost of living, but at the same time increase the pleasure of the table. Mrs. Scott’s point, though, is that you can do a great deal with what is on hand during a given season. Good advice for any age where cooks may be seeking economy, simplicity, and efficiency. And there are at least some options for those hot days when turning on an oven might be the last thing on your mind!